Today, HRC hailed the Delaware General Assembly’s passage of Senate Bill (SB) 65, legislation protecting LGBTQ youth in the state from the dangerous and discredited practice known as “conversion therapy.” The legislation was sponsored by State Senator Harris McDowell and State Representative Debra Heffernan, and Governor John Carney is expected to sign it into law. 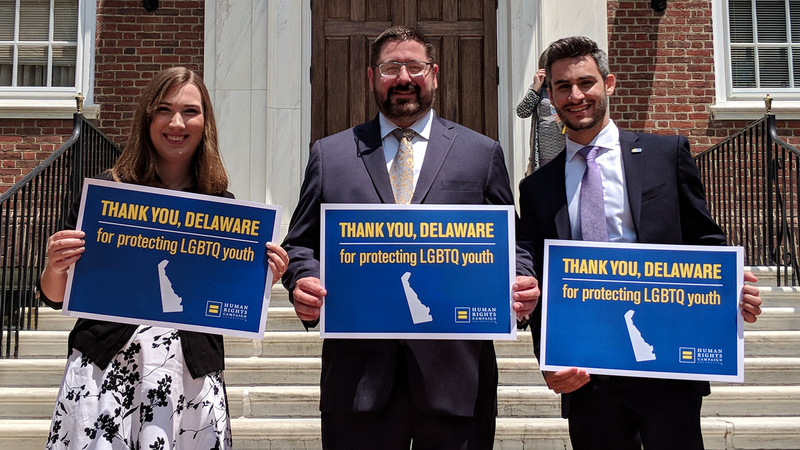 Once signed, Delaware will join 13 other states and Washington, D.C. with laws or regulations protecting LGBTQ youth from the harmful practice. Connecticut, California, Nevada, New Jersey, the District of Columbia, Oregon, Illinois, Vermont, New York, New Mexico, Rhode Island, Washington, Maryland and Hawaii all have laws or regulations protecting youth from this abusive practice. A growing number of municipalities have also enacted similar protections, including cities and counties in Ohio, Pennsylvania, Washington, Florida, New York, Arizona, and Wisconsin. In addition, lawmakers in New Hampshire recently passed similar legislation which currently awaits the governor’s signature.